Marathon Adventures is owned and operated by Steve Hibbs. Steve is a devoted family man, with two young children. He tries to spend as much time with his wife and kids as possible. Steve volunteers at his kids’ school, teaching gifted and talented reading and math programs. Steve also volunteer coaches his kids’ athletic teams, including baseball and soccer. In addition, Steve and his son earned their blackbelts in Karate and are now Sensei’s at the same school at which they studied. Steve’s founding of Marathon Adventures took a unique path. Steve studied Psychology as an undergraduate where he was a 4-year varsity letter winner in Cross Country & Track and Field. He then received his Master’s Degree in Human Resources. He began a career in Human Resources 20 years ago. At about the same time, Steve returned to Law School, where he completed his law degree and became a licensed attorney. Rather than practice law, however, Steve continued working in Human Resources for a few fortune 500 companies, including a large manufacturer, the world’s leading electronics retailer, the world’s largest medical device company and for Northwest Airlines. It was at Northwest Airlines where his passion for travel truly exploded. Prior to working for NWA, Steve had completed 19 marathons over the previous 9 years. In his first year at NWA, Steve completed 27 marathons in 25 states and 2 different countries. To date, Steve has completed 234 marathons in all 50 U.S. States, Washington D.C. and on all 7 Continents (three times). Steve was only the second known person to do so (there are now 5 or 6 who have completed) and the youngest to accomplish the feat. Since the announcement of Zealandia as the 8th Continent in February 2017, Steve became the first person to complete marathons on all 8 Continents – Twice, when he completed the Auckland Marathon in October 2017 and the 8th Continent Marathon in January 2018. Steve also became the 6th known person to complete Boston Marathon qualifying times in all 50 states on USATF Certified Courses, having run 145 total BQ Marathons. Steve is a 9-Time Boston Marathon finisher (1996, 2000, 2008, 2014, 2015, 2016, 2017, 2018 & 2019), having qualified for all of the Boston Marathons from 1996 to 2020 (25 consecutive years). There is no other Tour Operator who has committed themselves to running marathons at a quality level for the past quarter century like Steve has. Steve has also completed all 6 of The Abbott World Marathon Majors. Steve is also the only known person to complete marathons in all 50 U.S. States under 4-hours three separate times. 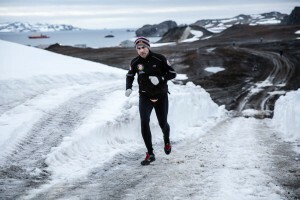 Of those 234 marathons, only 4 have been over 4 hours — two on The Great Wall of China and two in Antarctica. All the remainder have been sub-4 hours, with over 40 under 3 hours. Steve has a personal marathon best of 2:31:44. Steve has also completed half-marathons on all 7 continents (three times), completing The Triple 7 Quest in 2015 & 2017. In addition, Steve has extensive race management experience having managed road racing events since 1994. This coupled with having run so many races has helped Steve to design the most runner friendly courses at each location Marathon Adventures offers. In addition to the White Continent Marathon & Half-Marathon, Steve hosted the Triple 7 Quest – 7 Marathons, 7 Continents, 7 Days®, for the first time in 2015 with the goal of bringing 35 runners around the globe to run 7 marathons or half-marathons on 7 continents in 7 days. In 2017, Steve brought another group around the globe and successfully completed the Triple 7 Quest in 7 days. In 2018, Steve offered for the first time The Triple 8 Quest – 8 Marathons, 8 Continents, 8 DaysTM , after the announcement of Zealandia as the 8th continent. Steve offered the Triple 8 Quest, in addition to The Triple 7 Quest. Steve and the Triple 8 Quest/Triple 7 Quest groups successfully completed their Quests for the second consecutive year. Steve has traveled the world extensively, in addition to running marathons, having traveled to over 60 countries on all eight continents. Prior to offering an Adventure, Steve ensures that he or someone on our team has run the race before, so we can provide detailed descriptions and advice from first hand knowledge. Steve is also a USA Track & Field Level 1 Certified Coach. He has over 14 years of coaching athletes at the half-marathon and marathon distances. These are the traits that set Marathon Adventures apart from the competition — unparalleled focus on customer service, a quarter century of race management experience, a quarter century of dedication to quality marathon running, vast traveling and unmatched running experience. Steve is a member of The 50 States Marathon Club, The 50 States & DC Marathon Club, The 50 Sub 4 Club, Marathon Maniacs (Platinum), Boston 50 Running Club and The Marathon Globetrotters. Steve is also the founding member of The Official 7 Continents Marathon, 1/2 Marathon & Ultra Club, The Official 8 Continents Marathon, 1/2 Marathon & Ultra Club, The Eight Continents Club & The 8 Continents Marathon Club. Steve is also the founding member of the 5 Oceans Marathon, Half-Marathon & Ultra-Marathon Club — a new organization designed to recognize runners who complete marathons, half-marathons or ultra-marathons on all 5 Oceans.